These groups are further subdivided into numerous sub-groups, castes, and tribes. Indo-Aryans form the predominant ethno-linguistic group in India (North India, East India, West India, Central India), Bangladesh, Pakistan, Nepal, Sri Lanka and the Maldives. Dravidians form the predominant ethno-linguistic group in southern India and the northern and eastern regions of Sri Lanka, and a small pocket in Pakistan. Certain Iranian speaking peoples also have a significant presence in South Asia, the large majority of whom are located in Afghanistan and Pakistan, with heavy concentrations in Balochistan, Khyber-Pakhtunkhwa and Federally Administered Tribal Areas. Dardic peoples form a minority among the Indo-Aryans. 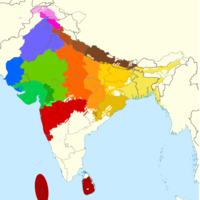 They are classified as belonging to the Indo-Aryan language group, though sometimes they are also classified as external to the Indo-Aryan branch. They are found in northern Pakistan (Northern Areas and Khyber-Pakhtunkhwa) and in Jammu and Kashmir, India. Minority groups not falling within either large group mostly speak languages belonging to the Austroasiatic and Tibeto-Burman language families, and mostly live around Ladakh and Northeast India, Nepal, Bhutan and the Chittagong Hill Tracts of Bangladesh. The Andamanese (Sentinel, Onge, Jarawa, Great Andamanese) live on some of the Andaman Islands and speak a language isolate, as do the Kusunda in central Nepal, the Vedda in Sri Lanka, and the Nihali of central India, who number about 5000 people. The people of the Hunza valley in Pakistan are another distinct population. They speak Burushaski, a language isolate. The traditions of different ethnic groups in South Asia have diverged, influenced by external cultures, especially in the northwestern parts of South Asia and in the border regions and busy ports, where there are greater levels of contact with external cultures. This is particularly true for many ethnic groups in the northeastern parts of South Asia who are ethnically related to peoples of the Far East. 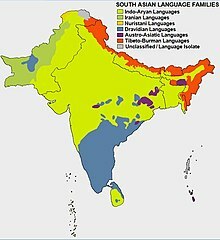 The largest ethno-linguistic group in South Asia are the Indo-Aryans, numbering around 1 billion, and the largest sub-group are the native speakers of Hindi languages, numbering more than 470 million. These groups are based solely on a linguistic basis and not on a genetic basis. The Dardic languages are largely seen as Indo-Aryan, but are sometimes seen as a separate Indo-Iranian branch. Boras trace ancestors to Arab traders and merchants. Chaush trace ancestors to traders from Yemen. Chughtai Tartars (Those people who originated in Uzbekistan and fought for Chagatai Khan who was son of Genghis Khan). Many South Asian ethnic groups and nationalities have substantial diasporas outside of South Asia. See also Bangladeshi diaspora, Indian diaspora, Nepalese diaspora, Pakistani diaspora, Punjabi diaspora, Sri Lankan Tamil diaspora, Tamil diaspora. ^ Yasmin Saikia (2004-11-09). Fragmented Memories. ISBN 0822333732. This page was last edited on 22 April 2019, at 01:49 (UTC).